Pre AVG: Pak was married in Jan, 1935 in China and immigrated to America by year’s end as an 18 year old. He received no English education in China. In Portland, Oregon, Pak attended only 2 years of grade school and 1 year of high school, yet he gained adequate proficiency in the English language to qualify for the AVG Allison training in early 1941 as a civilian. In early 1941, Pak applied and was accepted for Allison training along with the 8 other original Chinese Americans from America (the acronym, the CAVG, has been coined to refer to these Chinese American Volunteer Group members; all CAVG were recruited as civilians). Pak, being fluent in Chinese, became part of the core of Chinese instructors to train native Chinese in aviation who would be employed in Kunming to work with the AVG. On the day of the AVG arrival in Kunming, Pearl Harbor was attacked. The AVG mission quickly changed and the work of the CAVG as instructors also changed. The CAVG became involved in war related repairs instead of instruction. According to Kee J. Pon, an original CAVG member, Pak was a very competent airplane mechanic and was the only CAVG selected on many occasions to accompany aircraft recovery and refueling missions. Upon arrival in Kunming, 2 other Chinese Americans would be recruited into the AVG. The total of Chinese in the CAVG would be 11 at the beginning of their service. The CAVG served through the AVG period. However, prior to July 4, 1942, 3 of the original CAVG resigned the AVG. 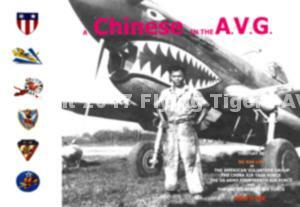 On July 4, 1942, Pak and 5 of the CAVG volunteered to continue with the 23rd Fighter Group, the China Air Task Force. The total Chinese in the AVG would be 8, as listed on the official AVG roster. These 8 CAVG would continue in their service through World War II. Pak and the other 7 CAVG would complete their service in the US Army Fourteenth Air Force. When the USA Fourteenth Air Force took charge, many more Chinese came from America to serve in many capacities. The CAVG members became military and realized much more support in fighting the enemy and their responsibilities eased. Pak was discharged with a rank of SSgt. As Pak served in the CATF period, his wife joined him on the battlefield on Jan. 1, 1943, after a 6 month solo journey to locate himfrom their coastal village 800 miles away. She stayed with him for the remainder of the War, following him and the Fourteenth wherever they would be based. In 1943 and 1944, a son and daughter were born. Pak would be the only serviceman raising a family and fighting the enemy simultaneously. They survived the War and returned to their village in early 1946. In early 1947, after a third child was born, the family emigrated to America, back to Portland, Oregon. Portland became the family’s new home town. As of this posting, Pak’s wife, Ying, is still living. Pak settled in Portland and applied his mechanical skills and experience to an automotive career. He became one of the top automotive diagnosticians in Portland. He was very adept at troubleshooting and repair with the barest of equipment, parts and under difficult circumstances. His War work ethic and philosophy was very evident in his work career. He gained a very well-known reputation as an honorable and dependable man, both in the automotive and Chinese community. His skills were in high demand. He was the only Chinese auto mechanic in the Portland area for many decades. As an immigrant, Pak attained what all immigrants seek by coming to America; a better life. But his focus was not to gain wealth, but to see that his family was well provided for and that his life philosophy would guide his children. The results of his philosophy became the better life he sought to attain. That philosophy included family allegiance, purposeful vocation, personal integrity, adopting the American culture and, above all, including Christianity as the guiding light for his family. His life reflected these values from very early on; and the result is that his philosophy continues in his family and his biography, ‘A Chinese in the AVG’.